Currently playing out off Minute Maid Park, The Houston Astros were established in 1962. The Astros original name was the Houston Colt .45’s. The first professional baseball team in Texas was The Houston Buffaloes, a minor league team established in 1888. Throughout the early 1900’s there were talks about bring a major league team to Houston, when the expansion from The National league allowed this to take place. There was a contest to name the team, which brought about the name Houston Colt. 45’s. The name is an interesting baseball name however only lasted two years until 1964 when the name was changed to the Houston Astros. With a change in the team’s name, came a change in the team’s stadium. The Houston Astros moved to the Astrodome, which made them the first MLB baseball betting team to play indoors. The name Astros came from the Astrodome, which was in honor of Houston’s role in the nation’s space program. It didn’t take long for manager Grady Hatton to take notice that the grass was not growing. There was a simple solution to this, artificial turf. The name Astro turf was given to development of artificial turf. In 1971 people were beginning to think that The Astros uniforms were a bit outdated. There were many changes in this era, where long hair and very different clothes were in style. The team changed the colors (not the style) from Navy Blue to orange; they took what was orange and changed it to a lighter shade of blue. During the same year of 1971 a very big trade took place, many MLB betting experts say this trade was one of the biggest trades ever. The trade took place between The Astros and The Cincinnati Reds. Many MLB fans have heard of the Big Red machine. The Astros traded Joe Morgan, Denis Menke, Jack Billingham, César Gerónimo, and Ed Armbrister to The Cincinnati Reds. In exchange The Astros received The Reds first baseman Lee May, Tommy Helms, and Jimmy Stewart. The baseball community was in awe that they general manager at the time Spec Richardson do make such a poor trade. In 1972 The Reds won the Nation League’s pennant. Although many MLB Baseball betting fans though the trade was a bad move, Lee May brought a ton of value to The Houston Astros. With Lee May The Astros had their first winning season. The winning steak did not continue, there were injuries to the pitching staff. The Astrodome fell into very big debt, the ownership was passed on to GE and Ford and this did include The Houston Astros baseball team as well. 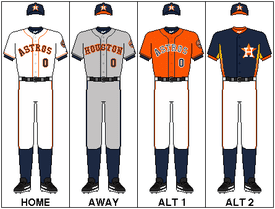 The year of 1975 The Astros introduced new uniforms again; this time the uniform had different shaded stripes of orange, red, and yellow in the front of the uniform. In the back of The Astros uniform there was a large blue star in the middle. The pants featured the same orange, red, and yellow stripes. These years were known as the rainbow years. The interesting thing is that the uniforms were so different than what the other MLB Baseball betting teams wore that they used them as home and away uniforms until 1980. The strike of 1981 turned out to benefit the Astros and gave them a leg up getting into the playoffs. The Astros had some major rebuilding to do in the 1980’s and finally got in shape for the 1990’s/. They changed their logo and they were perceived as a much more respectable team. In 2000 The Astros moved stadiums, they moved to Enron Field now known as Minute Maid Park.